Proves that simplicity is best. It really is a very beautiful Camellia. How long do they last in a vase? 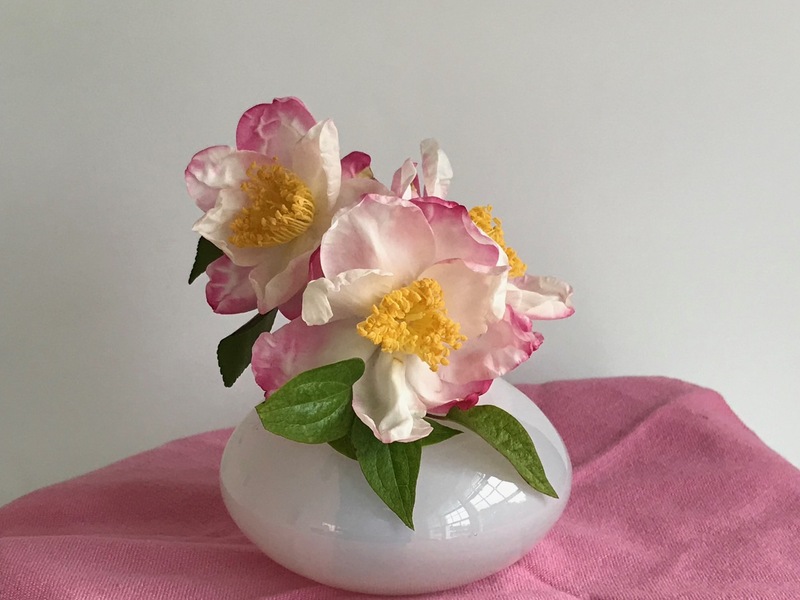 This camellia will last several days in a vase. There is little else blooming now so you may see this one again! That is such a perfect little arrangement and the vase suits it well. Thanks Linda. The vase is new this year and I like it, but it’s shape is such that flower stems easily slip right out. A most endearing arrangement and the flowers are gorgeous, as if made of porcelaine. Seeing how well my sasanqua made it through the drought, I should consider planting another one. Thanks Annette. Sasanquas I think are hardier and easier to grow than C. japonica, at least at my house. Such a stunning little arrangement, proving that less can definitely be more! The camelia blooms are simply beautiful. Thanks Elizabeth. 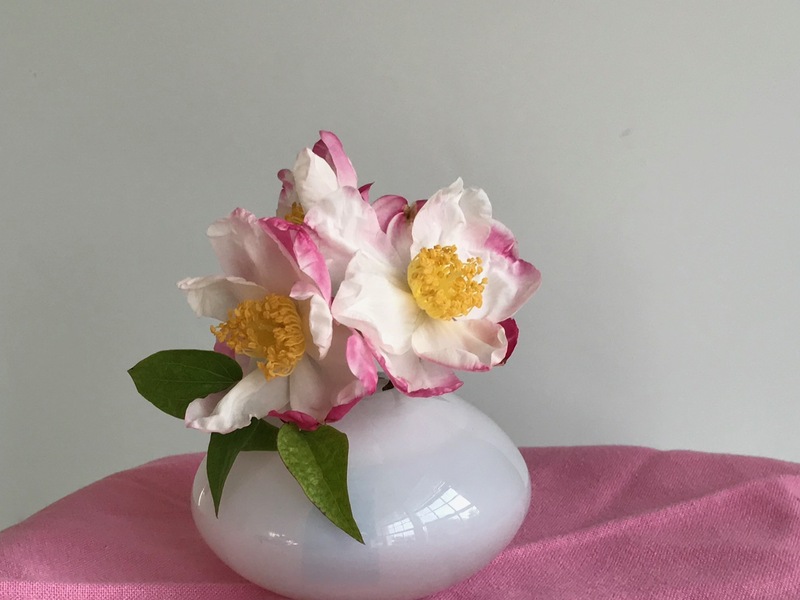 I felt the camellia stood best on its own, although I tried three or four other companions before letting them be themselves. Very pretty way to allow the camellia blooms to sing. Your recent inclusion of camellias had me checking my two camellia sasanquas for blooms but there’s nary a bud yet. Peter, hope your sasanquas will gift you flowers this year. They didn’t get pruned too late did they? Thanks Cathy. So happy to be able to join in again this week. The camellia has kept going admirably this fall. 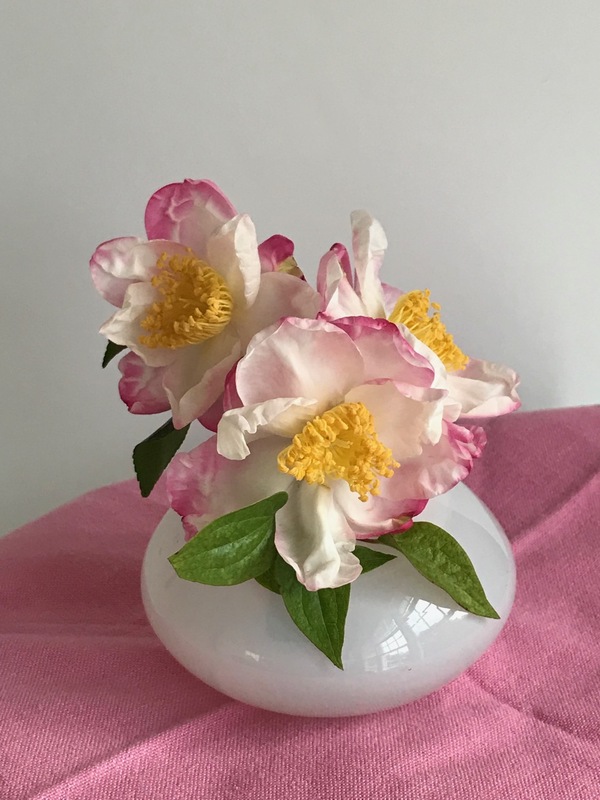 Your vase makes me fall in love more and more with Camellia…these are particularly beautiful with the tinge of pink….love how you arranged them. Donna, like anything when you start researching, camellias have amazing variety in form and color. This one has a unique crinkly petal I like, brushed at the edges with dark pink. 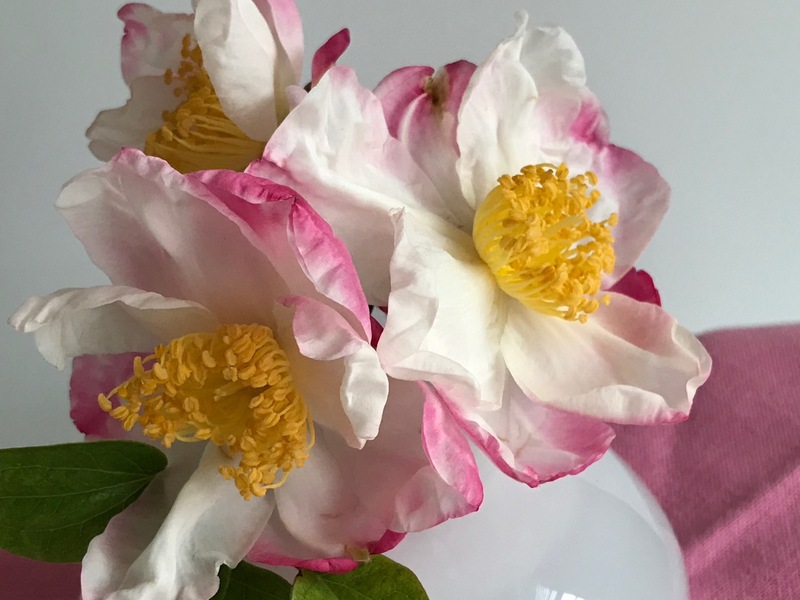 Such beautiful blooms….like a bride’s rumpled silk gown. No buds on our Camellias either. I hoped to have winter blooms but they seem to favor early spring instead.. Your use of yours is exquisite. Ricki, your early spring camellia show will be a welcome sight then. I have one camellia that blooms early March, but the weather is often unkind to it! The vase and the flowers make an excellent pairing, Susie. How I wish I could plant that beautiful pink and white Camellia in place of one of the solid pink ones that came with my garden but the difficulty of establishing a new Camellia under drought conditions keeps that temptation in check. …and I’d like one of your solid color camellias. I believe camellias do need a fair amount of water. If anyone could get one to thrive it would be you. You have an amazing array of blooms despite water restrictions. Happy Thanksgiving Kris. How delightful. Just today, and the past few days, we were trying to decide on a variety for a Camellia sasanqua. There were three originally; two white with a red in the middle. Because we can not match the original white, we will probably get a pink. I do not know what the red one is, but it is not the common ‘yuletide’. Good luck with your camellia choice. I would like a white one–keep looking at Autumn Moon. I would prefer a white camellia too, but not if it does not match the original. I don’t want it to look like something is wrong with one or the other. Yes, it is rather feminine, isn’t it? I’d love a pure white one, but haven’t been able to get one established (Autumn Moon). Oh, these are so pretty! So delicate. Are they or are they tough? Tough! They’re really thriving this year, which is wonderful. I love that pretty camellia so much I am going to see if I can find it available here. A charming arrangement. Quite a compliment and it would be lovely to know we’re growing the same camellia! Good luck in your search. Those beautiful ladies don’t need anything else to accompany them in that lovely vase on the pretty pink tablecloth. Perfect. Those Camelias are very sweet. Thanks Jason, I’m enjoying camellias so much this fall while little else is blooming.